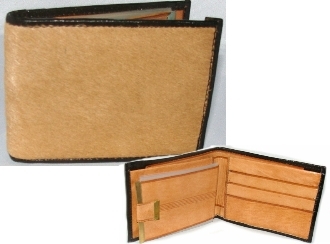 Real Cowhide Leather bi-Fold wallet. Each one is hand made. No 2 are every alike. BECAUSE THIS IS REAL hair on hide, the paterns will not be the same in every wallet. LAYING FLAT and OPEN: 9" X 4"